Its good to see that some of the later Animated toys will be available as imports at the very least. I wonder if it will make Hasbro not really push as hard to get Wingblade Prime on the shelves as an exclusive somewhere? I heard this rumor that the Internet can be used not just for complaining, but buying toys as well. Don't quote me on that though. For Thundercracker and Mudblaster Bulkhead, what would you have us do? Learn the ins and outs of buying Chinese factory runoff? No thank you. Though the listing for Elite Guard Bumblebee intrigues me. That was clearly a non-show repaint.. does that mean they'll release non-show repaints that we never got, like Toxic Oil Slick, Fugitive Wasp, and Vortex Blurr? My guess would be that EG BB is being released becasue it's a key cast member, albeit in a non-show colorscheme. they should just stick the remaining animated molds in Generations packaging and put them in the main assortments. screw the exclusivity nonsense and just make the money back on the molds already. 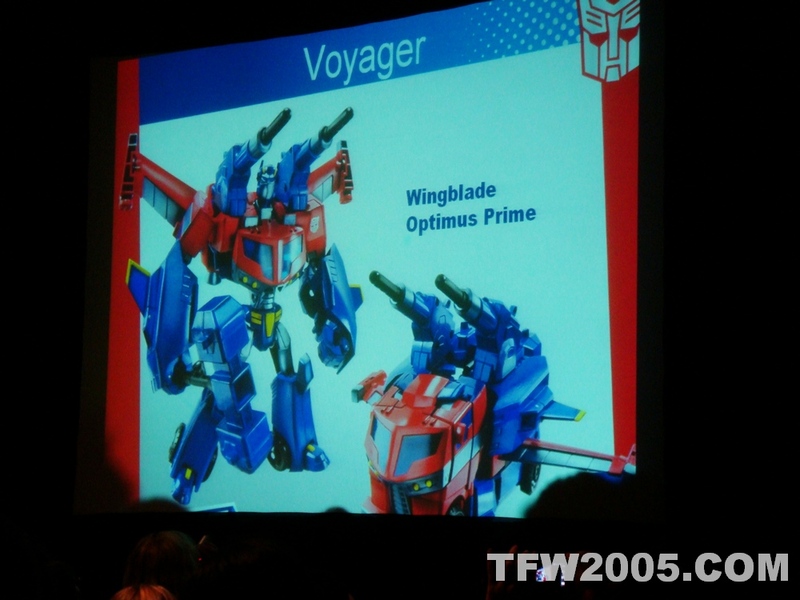 That might work for the deluxe figures (though after we get Rodimus & Ironhide, all the rest of the Animated deluxes we've seen are straight repaints), but Wingblade Prime, Blackout, Hydrodive Bumblebee, Thundercracker, Mudbuster Bulkhead, and Goldfire Grimlock are all Voyagers, and Generations is deluxe-class only. Rakuten Market changed the price around 5pm yesterday. I thank for your information. These release information expects a true thing of me. I am sorry that there is not information of Constructicon. Only the core characters have the gloss, the other figures just have modified paint jobs. Even when they're 'modified', they're in no way superior. We've seen Shockwave, Grimlock and Blackout and all 3 so far have nonsensical color changes that hardly make them work the 100% markup. Plus, as I said, no Thundercracker. You want him, you're out of luck. Best Transformers news I've heard in a while. I'm really anticipating Wingblade Prime and Jetpack Bumblebee! God I want a Wingblade Optimus! I really hope that figure sees a release somewhere. Like others have said, I don't care if it's released in the US or Japan (although I'd prefer US for cheaper prices) I just want to get Wingblade Optimus to add to my collection! Ugh, not even the fact that this may be the only way to get these toys can make me look past those glossy paint-jobs. Plus, no Thundercracker. I SERIOUSLY hope they come out with an all chrome version of Ironhide (not Bulkhead), that would be too awesome! Come on, Hasbro. You've designed the packaging for several already and everything: don't let guys with access to Chinese factories to be the ones that have the advantage. I'm willing to pay more, but with a weak dollar/yen exchange, it's just too insanely expensive to be worth it, especially with some of the nonsensical color choices. well, i guess a slightly more expencive japanese release is better than no release at all..
Sure hope it's true. I'd be happy to import this Prime and Bee. I'm quite relieved to see that, as I was starting to boggle over the prices in the original post and wondering why the hell they cost so much at retail, let alone with import fees and other markups applied. The new adjusted prices are what they should be. Personally Wingblade Prime is the one figure I feel is a must have for my Animated collection to feel complete. (Omega Supreme; at any size, would be nice too, but I'll go with very unlikely.) Others will be welcome, but Wingblade to me feels like a must. I can live with the shiny paint if that's my option, and with a reasonable price, I'll even preorder it to make sure. I'd love to see a pic of what their Leader Megs will look like though. Leader class Ironhide/Bulkhead is missing. I would be quite astonished if Leader Bulkhead comes out. Multiple versions of essentially the same figure at a higher pricepoint is uncommon over there, as are toys that aren't screen accurate. This is even more so when the line already has a US release for them to pick and choose from. Beast Machines Tankor was a basic, they never got the "Voyager" version, for example. Supreme Prime and Leader Bulkhead will likely never show up over there since there's essentially a smaller, "better" version available. Please get Wingblade Optimus and Blackout on shelves. They didnt want to stock any, what makes you think Hasbro hasnt already asked any of them? Be glad TRU decided to even get Arcee, cybertron mode Ratchet, Ironhide and Rodimus. we can only hope one of the other retailers figures this out and takes on some exclusives. currently i am happy for any release anywhere. Just curious, why is Rodimus so much more expensive than the others in that class size? All times are GMT -4. The time now is 4:03 AM.